T he term "destination restaurant" usually also means "big bucks restaurant." But among restaurants in San Miguel de Allende, Ole Ole proves that a "destination restaurant" can be unpretentious, inexpensive, delicious and a whole lot of fun all at the same time. Ole Ole is one of my favorite places to take out-of-town friends—if only to watch their faces when they walk into this homage to the "Fiesta Brava," the traditional world of bullfighting. The owner is a true bullfight aficionado, a lover of the sport, the art, the dance that is the Fiesta Brava. 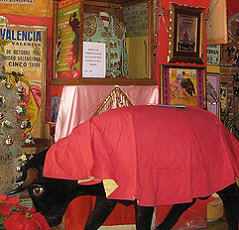 The first thing you see on entering is a huge stuffed bull just inside the door, usually draped with a matador's magenta capa.. Just try to stop yourself from petting him. Go on, I dare you! The next thing you'll see is...red. The tablecloths, the archway—with a little yellow and orange and green thrown in for accent. And the walls...they're also mostly red, but you won't see much of them because they're covered floor to ceiling with bullfight memorabilia. There are dozens of bullfight posters, paintings and photos of famous toreros, crossed banderillas with their colorful curled paper ends. A suit of lights. And bulls. 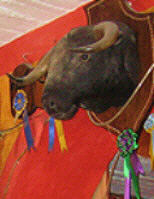 Lots of bulls—well, their heads anyway—mounted high on the walls gazing down at you. If you let the idea of eating beneath the gaze of a creature several times larger than you put you off, you'll be missing out on one of the best meals in San Miguel de Allende. The menu is strictly limited and not a good option for vegetarians. This place is about meat, and especially fajitas. You can order beef, chicken, shrimp or ostrich fajitas or a combination or all of them. They come with corn or flour tortillas, tangy house-made salsas, and vegetable garnish. Another option is brochettes on skewers, same meat choices, or a delicious arrachera, a kind of very tender skirt steak. Portions are huge and filling and prices are very reasonable. You can easily eat a full meal for under ten bucks, and that makes this one of the best value-for-money restaurants in San Miguel de Allende. A fine appetizer is the classic queso fundido. The gooey warm melted cheese scooped up with fresh corn tortillas is Mexican comfort food at its best. They also serve excellent guacamole, mushrooms al ajillo (read garlic), and chistorra sausage.